Looks like more bling at international shows for local potstill brandies. 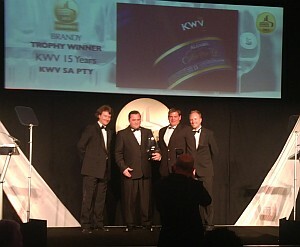 At the ISC awards held in London last night, KWV 15 year old was awarded the trophy for world’s best brandy, and not to be outdone, the KWV 20 year old also picked up a gold medal. Undoubtedly a massive achievement for the guys, and in my view the definitely the right result. I have been expecting these brandies to do well on the international stage, since first sampling the new blends back in may last year. We took a little trip down to down to Paarl for a guided cellar tour with Pieter de Bod (Manager – Spirits) and Lourens Stander (Manager – Blending and Distillation), and certainly left with a high affinity for the superb brandies the guys were making. Pieter took us through the new KWV 15 year old brandy and KWV 20 year old brandy blends and explained how they were experimenting with new ideas. Certainly a risk for such a well established brand with such well set expectations from ardent brandy fans out there! But clearly one that has paid off for them. And I for one am very happy to see it! Looking forward to getting the full list of results from the ISC to post soon and see which other of our local gems performed well, and also seeing if KWV gets the same accolades form the other big contests happening later this year.